In this follow up episode, Jean is joined by the ‘King Of Podcasting’ himself; Jonathan Rivera. With over 1.2 million podcast downloads and over 24,000 minutes of audio, you could say Jonathan knows a thing or two about audio communication. Choosing the right communication channel for your online business isn’t a one size fits all decision. It’s a personal choice that only you can decide. If writing is something that flows naturally, then blogging could be your answer. On the other hand, if putting pen to paper or fingers to keyboard is mentally challenging, audio and video could be the communication channel you focus on. Master one communication channel first and then branch out to bring a new dimension to your online business to create huge leverage in your online business. 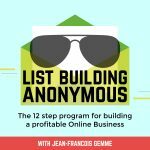 The List Building Anonymous Podcast is all about showing you exactly how to build a profitable online business through Jean – Francois’s unique 12 step program. It’s the only podcast that delivers A to Z strategies directly from the trenches without the added ‘fluff’. A 12-step program for building a profitable Online Business and the only podcast which delivers A to Z strategies from the online trenches and experts straight to you.